This MP3 file is from the album Water settings : Australian music for percussion duo / Match. Instrumentation: 2 drummers (each with 5 drums). Duration: 7 mins, 16 sec. Recorded/performed at: Recital Room East, Sydney Conservatorium of Music, on May 05. Score: The Crantock gulls : for two drummers / Andrew Ford. Parts: The Crantock gulls : for two drummers / Andrew Ford. 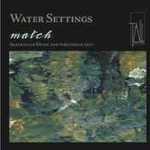 CD: Water settings : Australian music for percussion duo / Match.